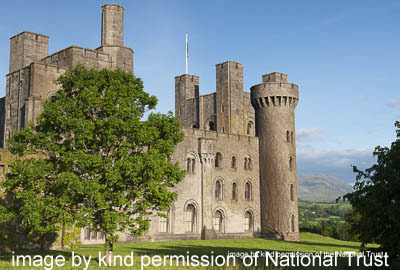 Penrhyn is one of the most admired of the numerous mock castles built in the United Kingdom in the 19th century; Christopher Hussey called it, “the outstanding instance of Norman revival.” The castle is a picturesque composition that stretches over 600 feet from a tall donjon containing family rooms, through the main block built around the earlier house, to the service wing and the stables. The present building was created between about 1822 and 1837 to designs by Thomas Hopper, who expanded and transformed the building beyond recognition. However a spiral staircase from the original property can still be seen, and a vaulted basement and other masonry were incorporated into the new structure. Hopper’s client was George Hay Dawkins-Pennant, who had inherited the Penrhyn estate on the death of his second cousin, Richard Pennant, who had made his fortune from Jamaican sugar and local slate quarries. The eldest of George’s two daughters, Juliana, married Grenadier Guard, Edward Gordon Douglas, who, on inheriting the estate on George’s death in 1845, adopted the hyphenated surname of Douglas-Pennant. A very large rectangular carpet. Floral design with garlands, baskets and urns of flowers within a floral border, both main field and border originally on a light tan ground, now faded. Down the middle of the carpet are three garlands of flowers. The central one with two huge flower-filled corinthian urns on either side across the centre of the carpet. The two flanking garlands are identical, enclosing a ‘cushion’ shaped emblem with shells and a central rosette. There are four identical baskets of flowers along the sides, opposite the flanking garlands. At both ends, central, are baskets on taller foliage plinths. Small individual flowers are scattered around the side baskets and central garland. Filled poppies in each corner. Centre sides – two pink roses and change of direction of the flowers. Cut to fit this room from what was probably a rectangular carpet. Now 13’6” wide and approximately 20’6” long. Upper end has been cut. Lower end obscured by runner. Because of the later cutting one can’t be certain of the side and end design. Main field a square central panel enclosing a central circular design in browns, mustard and russet on a pinky-brown ground. Central panel comprises, central roundel with formal design of stylised anthemion on ‘spokes’ surrounding a small eight pointed star. Three encircling narrow borders separated by striped guards. A wide encircling border of scrolling foliage with two bearded leopards opposite each other, facing outwards.